NETRO2 is the embedded type solution based on SMSC's JukeBlox platform. The host micro processor is also provided in order to control CX module. NETRO2 is the solution with radiko function which Heartland.Data is implemented on SMSC’s JukeBlox platform. NETRO2 has music streaming functions such as AirPay, radiko, DLNA using a living network, it is specialized for add-on to the existing audio system. 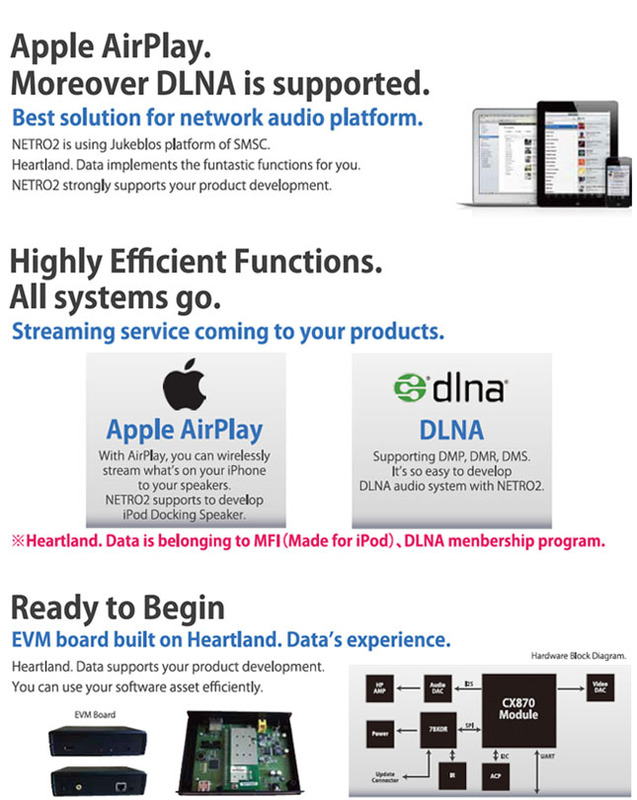 We provide the EMV board which is equipped with the Heartland.Data’s extensive experience and we support customer who has no experience of development network audio product in the early stage of specifications study of your product. We also provide sample of host micro-processor software (module I/F), so it is possible to start product specification study diverting your existing GUI asset right now. Please download the “NETRO2″ catalog (PDF, file size:238KB) from Here. We are happy to help you to purchase NETRO2. For more detail, please contact from this page.